**BRRRRRAAAARRRRAAAAARRRRRRRAAARRRRRRRUP!!!! ** Ooops, 'scuse me..... :P d.m.f. [Gift] Amy at the Eclipse! [Gift] "We're all mad here..."
Underaged furs, both clean & naughty! High on a hill in Eldorado. I am a writer, not an artist, and an active member of the furry community since 1985 (online since 1991). All artwork here are by others, either as gifts, requests or commissions over the years- I do not assume copyrights on these works. My own written works are copyrighted under a Creative Commons BY-NC-SA license. All submissions herein comply with the "By You, For You" rule. 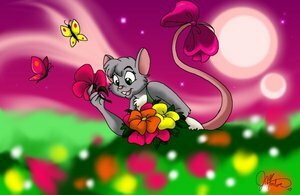 I have several characters, most notably, Amy Stereo, my little mousegirl with the huge tailbow. The Great Leptictidium Crusade! : I encourage artists to draw the cutest of all extinct prehistoric species, the leptictidium, particularly as anthros, so this species will not be forgotten. My PayPal "tip jar" - amymousie*at*yahøø*d0t*c0m - Thank you. Thanks for the watch *v* !